We are a full service facility fabricating and constructing various types of steel including: Steel, Stainless Steel, and Aluminum steel. We have the abilities to read and follow blue prints of any type. This gives us the ability to hold exact tolerances that are required. We are able to fabricate all types and size assemblies and customer satisfaction is our main goal. We have the ability to Form up to 3/8 inch Thick X 14 Foot long material and Shear up to 1/4 inch Thick X 10 Foot Long material. Rather it be a repair or a full custom job, we can produce quality products at a high pace. River City Machine & Tool, Inc. is happy to say we have been in business for over 45 years and we offer serveral types of welding services including, but not limited to: MIG, TIG and stick welding. 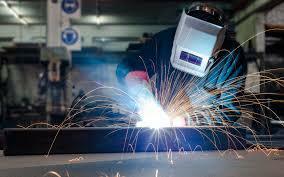 We are able to weld Aluminum, Stainless Steel and Steel as specified.